The My eBay page is your space to personalize and manage all your eBay activities. After you register, your personal My eBay page helps you track the items you’re watching and bidding on, as well as items you’ve already bought and sold. You can access your My eBay page at any time by clicking the My eBay link in the navigation bar at the top of every page. Buy: You see every listing that you’re currently bidding on, have marked to watch, or made a Best Offer on, and the auction items you won or didn’t win. Sell: You see every listing for items you’re currently selling. Also, you see links to any listings you’ve scheduled to start at a later date. Most important, you have links to lists of items you’ve sold (and not sold). Messages: This tab links to your My Messages area, eBay’s private e-mail service for members. My Messages is the best and safest way to communicate with other eBay members. Organize: This area links to your collections of Saved Searches, Saved Sellers, and your personally specified lists. Account: You can use this tab to select activities for which you want eBay to remember your password, which saves you from having to type it every time. From here, you can also change your personal information on eBay. You can see what you currently owe eBay and link to your PayPal and Half.com accounts as well. 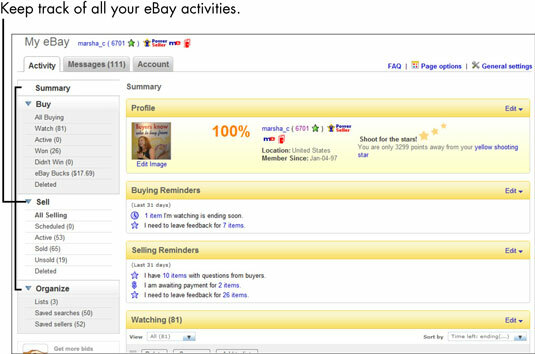 Your My eBay page also has three tabs at the top of the page below the My eBay heading: Activity, Messages, and Account. If you put your mouse pointer over the Account tab, you see a drop-down menu. Clicking Account brings you to the summary page that has snippets of each topic in the My Account section. It’s really better to click individual drop-down menu options so that you can go directly to the places you want to explore. The options on the Account drop-down menu direct you to areas where you can update your contact information, your preferred payment and shipping addresses, preferences for notifications and other communications, as well as other site preferences. You can also access other areas that interact with your eBay activities, including your PayPal account (for making and accepting payments) and the area showing feedback you received or need to send. Initially, your contact information comes from your registration. But it’s policy on eBay that every user files her current contact information — so if you move or change phone numbers, e-mail addresses, or banks, be sure to update that information here. When setting your notification preferences, consider carefully how many e-mail messages you want to receive. If you do a lot of buying and selling and you sign up for all notifications, you may find yourself with an e-mail deluge. Select wisely — for sanity’s sake, narrow your selections to the minimum. And remember, you can always change your choices later. Bookmark the page as a favorite by choosing Favorites→Add to Favorites in Internet Explorer (or by using the appropriate menu or button for your browser). You can then pick your page from the Favorites list. Send a shortcut to your desktop by choosing File→Send→Shortcut to Desktop. Then, when you click the shortcut that magically appears on your desktop, your browser opens directly onto your My eBay page. 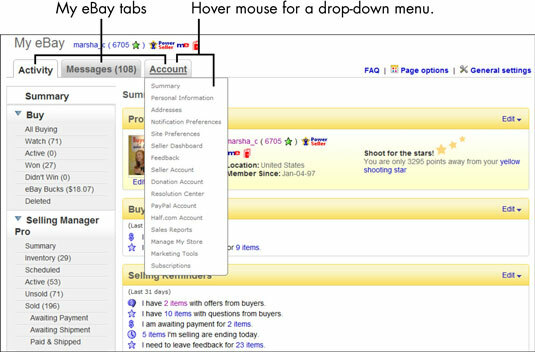 As some other eBay members do, make your My eBay page into a browser home page by clicking the down arrow next to the home button (which looks like a little house) and choosing Add or Change Home Page from the drop-down menu that appears.